Our friends at UPROSE are hosting a community forum next Wednesday, March 31, on the implementation process of the Sunset Park “Greenway-Blueway” concept. The project is part of the Vision Plan for the Sunset Park Waterfront, which will revitalize this dilapidated industrial area. It includes modernizing the maritime and industrial infrastructure and re-activating vacant or underutilized space, as well as creating a new park at the Bush Terminal Piers and a path for pedestrians and bikers to connect parts of the waterfront to residential areas of Sunset Park and Bay Ridge. Coordinating green space (Greenway) to lead to the waterfront park (Blueway), the Greenway-Blueway plan will add 25 acres of green space to the community. After facilitating the design of the “Greenway-Blueway” plan, UPROSE now focuses on the details of implementation. Held from 6:30pm to 8:00pm at 166a 22nd Street in Brooklyn, the community forum gives participants the opportunity to learn about and get involved in the implementation process. To RSVP and request translation or childcare service, contact UPROSE at (718) 492-9307 or info@uprose.org. 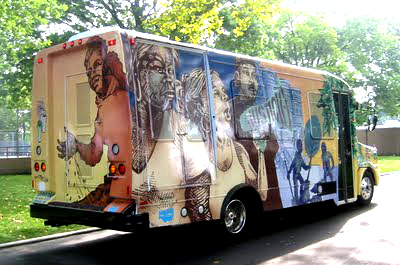 UPROSE also offers monthly “Environmetal Justice” tours around the Waterfront area using uniquely decorated, environmentally friendly buses. The tour is free for Sunset Park residents; for others, the fee is $20. You can catch the two-hour ride before Wednesday’s forum from 4pm to 6pm. If you are interested, reserve your seat early (see contact info above) as space is limited.